Since Christina and I had previously visited Banff, I figured I was under no pressure to "see the sights" yesterday on my free afternoon. So I decided to do some geocaching, which led me to sights I would not have ordinarily seen. I actually found one geocache on Sunday -- about 50 feet from the conference site. After failing to release Free State Mover #3 in Puerto Rico, Malaysia, Singapore, England and Turkey, I finally set it free. It should have an easier task of getting back to Maryland than its European predecessors. In a previous post, I claimed that "virtual" caches had been eliminated. That's not entirely true -- there is a special type remaining: the Earthcache. Unlike the old virtual caches, which could be of anything the submitter found interesting, Earthcaches have to teach something about geoscience, and it has to be approved by the Geological Society of America. This approach seems like a good compromise -- it allows caches in sensitive areas where you can't put a physical cache, but it limits their proliferation to educational sites. The first cache I visited yesterday was, in fact, an Earthcache. It was the Banff Upper Hot Springs. Christina and I had visited there, so I didn't feel a need to bathe in the springs this time. Good thing -- paramedics were treating a woman, and the line of people waiting to get in the pool was backing up. My second cache was another Earthcache and another set of hot springs. 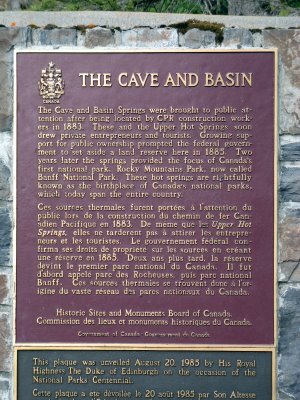 As it turns out, this set of hot springs is no longer open for bathing, but it is an important place in Canadian history. 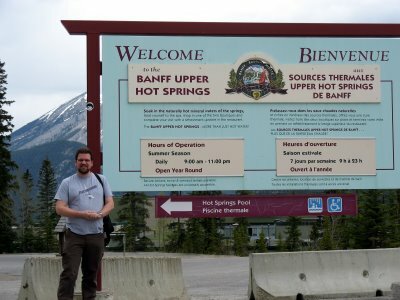 When trying to figure out what to do with the springs, the Canadian government decided that they should be publicly owned. 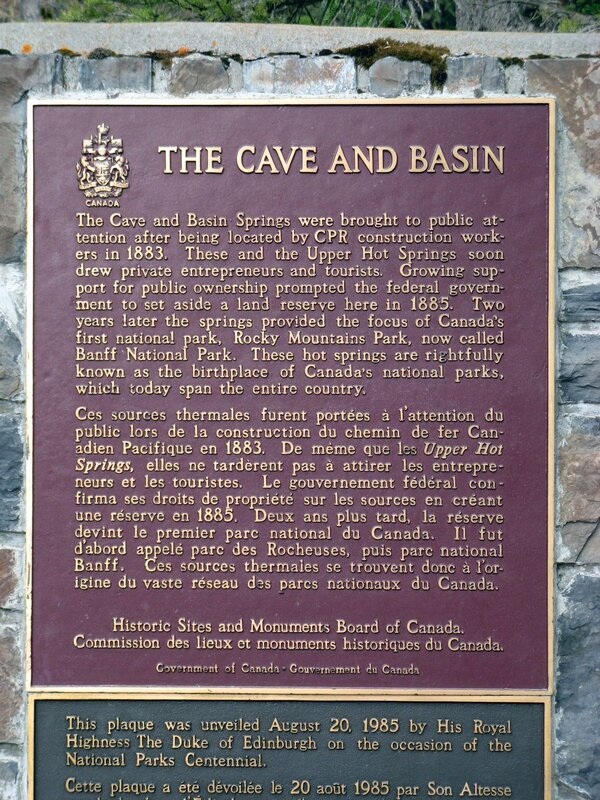 This decision eventual led to the establishment of Canada's first national park. 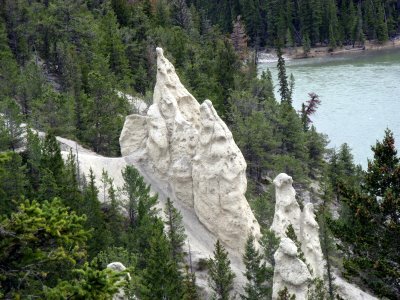 Looking for another cache, I was led to my third Earthcache of the day, Limestone Hoodoos in Banff. A hoodoo is a particular geological formation (pictured) created by uneven erosion of sediment. After taking some pictures, I headed out down the Hoodoo Trail. A sign said that walk was 1 km and about half an hour. I turned around when I reached 1.55 km (as the crow flies) -- I'm not sure what the 1 km represented. 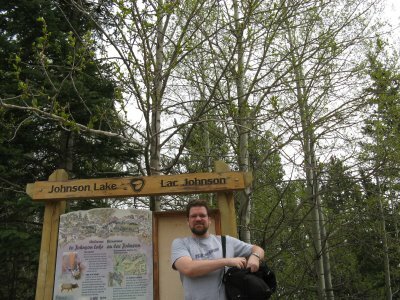 I decided the day of geocaching wouldn't be complete without finding a physical cache, so I headed to Jumpin' Johnson Lake. The cache was about one-quarter of the way around the lake, but I continued to walk the whole way around. While walking, I was listening to a geocaching podcast where they had a call from a listener who had reached 500 caches about two months of caching. Given that yesterday's haul of 4 matched my all-time high, I am clearly in a different category from people like that. (I'm at 49 total after 14 months.) 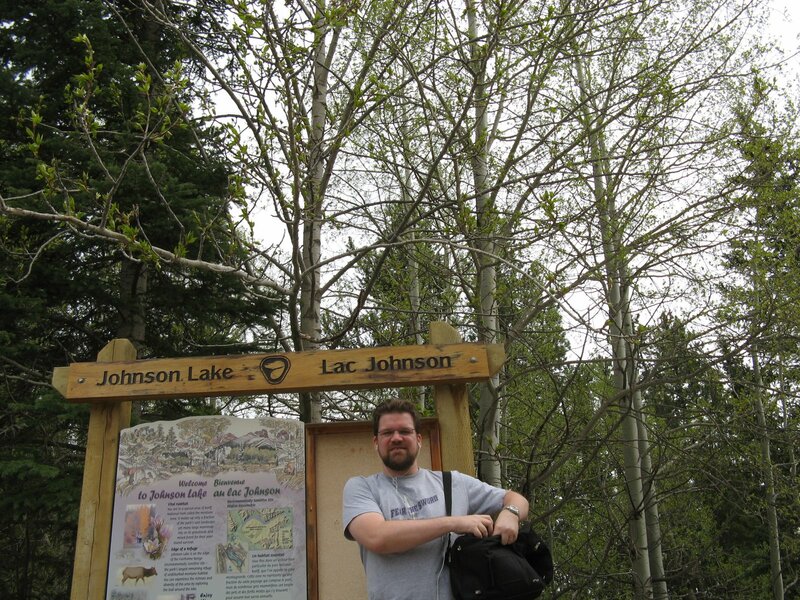 But I'd rather use geocaching as a jumping off point -- I wouldn't have come to Johnson Lake without it. As a result, I got some nice scenery and some much-needed exercise. I almost got more exercise than I bargained for. As I had almost completed my circumnavigation of the lake, the trail dead-ended at the lake. I was afraid I was going to have to go all the way back around. First, however, I tried doubling back and seeing if I had taken the wrong fork. As I got on a more promising path, I noticed a rushing steam that would block a walk around the lake. Fortunately, a few minutes later, I saw the bridge that would allow me to complete my hike.